I was happy to read in the comments that I am not the only one who hasn’t sent all their Christmas cards yet. I am making progress; I’ve written 67, sent 60 and have 12 left to write. 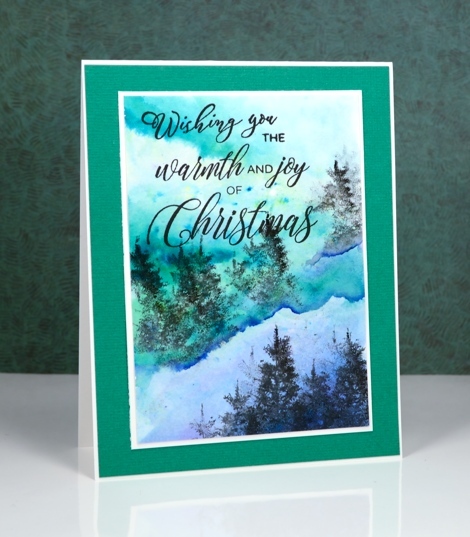 The card I’m sharing today shows a little sentiment splicing; I’ve taken the ‘wishing you’ from the festive snippets set and added it to half of a stamp from the festive cheer set. The lettering in the two sets combine nicely along with the small capitals on the little words. You can get more from your stamps if you take a look at which sentiments might mix and match with each other. A stamp positioning tool makes this kind of thing easier but partial inking and masking works if you don’t have a handy dandy tool. The landscape for this card was definitely a brusho experiment. I sprinkled blue and green brusho on my watercolour panel then moved water around with a paintbrush to create some hard edges and feather out other areas. After I’d created my misty mountains I did partial inking on the little tree stamp from the prancers set to fill in some forest on the mountain sides. How do you keep your water color panel from curling? I gave up using these because I could never get them to stay flat enough to not pull up from the card. While I’m painting I have my watercolour paper taped down with painter’s tape which I leave in place until the panel is dry. When I attach it to my card I use Sookwang ‘Be Creative’ two sided tape which is very strong and stops any corners from peeling up. Another trick to get your paper flat is to iron it after your painting has dried. Once again, I am wonderfully amazed at the ‘atmosphere’ you create in your winter scenes! 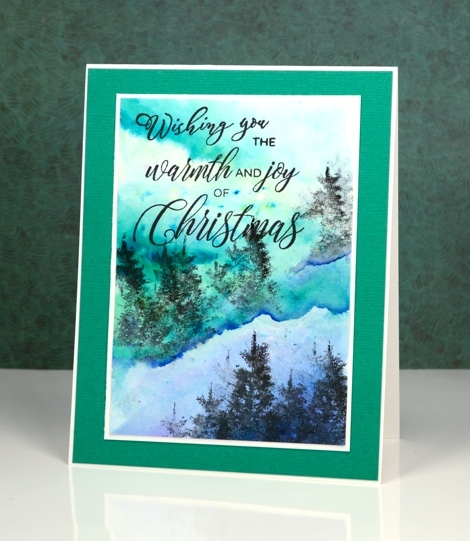 I love the layers and colour variations you put in this little masterpiece! From the bottom of my heart, I thank you for all the inspiration and joy your beautiful works of art have brought to my little world! Your hard work so faithfully offered has been much appreciated! May you have a sweet and blessed Christmas…and a Happy New Year!